Today, boys and girls, we're going to play in mud. Drywall mud, that is. Mud is more fun to say than pre-mixed drywall joint compound, so I'll go with it. Mud is usually a mixture of pulverized limestone, water and other additives. It is used to tape and finish seams between drywall panels, repair dings and holes, and smooth out wall irregularities. Many folks would scream at the idea, but I have used hot-mix mud to repair plaster with impressive results. But we're not talking about hot-mix today. Sheetrock is one of several mud brands that I have used. Some folks think the words "ready-mixed" or "pre-mixed" mean the mud is ready to use straight out of the tub. Not so. Well, you can, but not if you want good results. Pre-mixed mud has been blended with water, but it's not smooth. 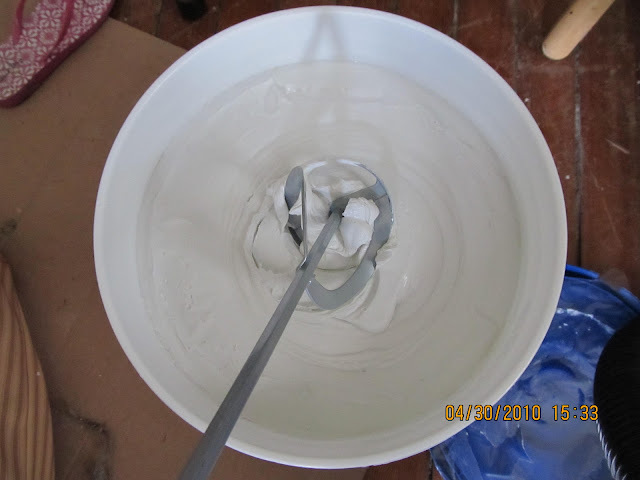 If you want smooth, even walls, not to mention a lot fewer headaches, you have to mix pre-mixed mud. When buying pre-mixed mud, opt for the heavier container. I know, I know. It weighs a lot more than lightweight joint compound. Lightweight mud is basically mud plus air. Do you really want to pay for air? If the bucket is too heavy, the nice guys at Lowe's and Home Depot will load it into your buggy. They'll usually load it into your vehicle as well. At home, you're on your own. A brand new bucket of mud comes out lumpy. Lumpy mud is hard to work with. Even the smallest lumps leave ridges across the wall when you spread it with a mud knife. You'll chase the lumps, work out ridges, get really tired, switch hands with the mud knife before carpal tunnel sets in, possibly say some bad words, introduce more lumps and ultimately cause… more ridges. This is why we mix. Unless you have arms like Paul Bunyan and are a glutton for hard labor, you need a mud- or paint-mixing tool. The one I use looks like this. Fasten the top of the rod to a power drill, and voila! You've got a mud mixer. You can also use it to mix paint. 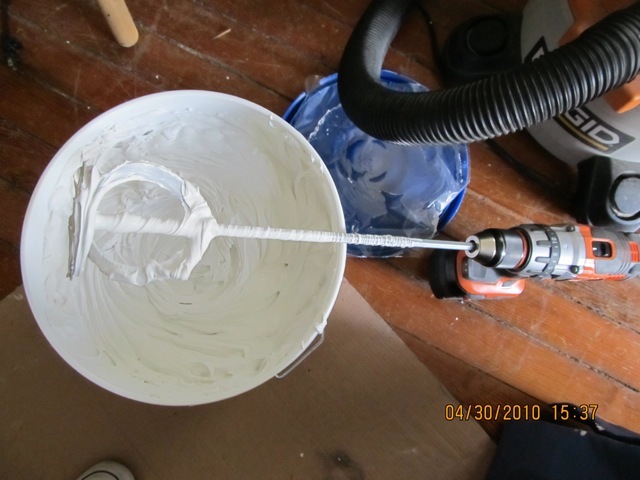 In addition to a mixing tool and a drill, you'll also need a clean, empty bucket with a secure lid. Scoop out about half the mud from the new container, put it into the clean bucket and seal the bucket. 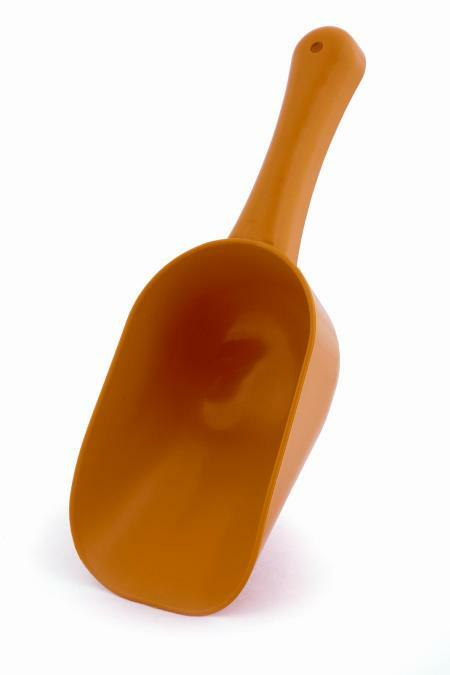 Mud is very stiff at first, so use a sturdy scoop. I use a large dog food scooper. Many folks scoop out mud with a mud knife, but that is a bit difficult for me. 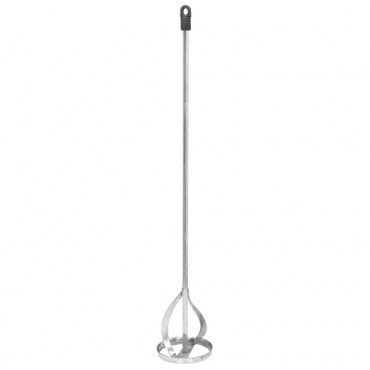 Plus, a plastic scooper is easy to rinse out and can't rust. Rusty mud knives are a pain in the rear. Don't use it to scoop pet food after using it with mud. When you open a new bucket of mud, there's a little plastic film covering the top. Save it. Pour about a cup of water into the open bucket and get ready to mix. Brace the bucket between your feet, and hold on tight. If you can't do that, ask someone to hold the bucket while you mix. Turn on the drill and slowly push the mixer into the mud a little at a time. If you push the mixer into the mud before you turn on the drill, you won't be happy. The bucket might spin, the drill might fly out of your hands or you may just dislocate your shoulder. If the planets are properly aligned, you might even accomplish all three at once! Well-mixed mud is the consistency of cake frosting. It should not drip off the mixer. If it's too thin, add some unmixed mud from the other bucket. Use low speed and high torque at first. Raise and lower the mixer through the mud, scrape the sides of the bucket and blend it until all the lumps are worked out. Increase the speed of the drill as the mud gets smoother. If it's still too thick, mix in a little more water. When it's fully blended, raise the mixer out of the mud and spin off the excess inside the bucket. If you're like me, you'll set the mixer on the floor and let it dry before cleaning off the mud. You should rinse it off while it's still wet, but I am always too anxious to get on with the mudding part. You can use the mud right away or close up the bucket and save it. Scrape off the excess mud on the sides of the bucket, put the plastic film on top of the mud and seal the bucket. If you leave mixed mud too long, you'll need to add a little more water and blend it again. And that's how you mix pre-mixed mud. It's scary how much fun DIY home improvement can be. Or maybe I just need therapy. **Drywall joint compound is not the same as spackle. Spackle performs very well for filling and patching tiny nail holes, but you'll hate yourself in the morning if you try to use it on a large area. It dries exceptionally hard and is difficult to sand, it won't hold seam tape properly, and it's fluffy and filled with trillions of air bubbles. You're a star, Lady. What would we do without your fix-it-yourself advice? 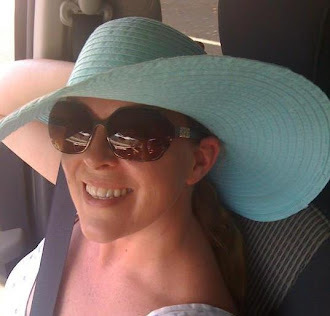 Great blog!! !We must avoid roughing the surface paper of the drywall insulation panels when sanding. 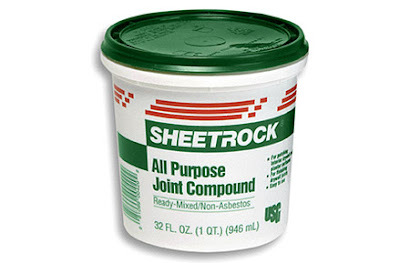 If we do rough it by accident, repair the damage by applying a little joint compound with a 5” knife. Thank you so much for sharing. I am lucky I found this article!